Imagine putting first responders on your operational team instantly on alert about new network vulnerabilities – and how to fix them? 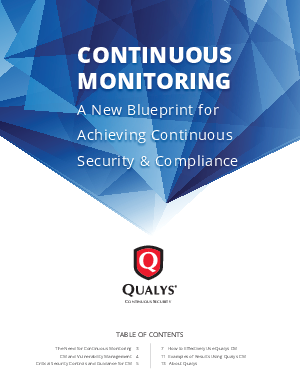 This capability is called “continuous monitoring” (CM) and a new guide from Qualys shows you how it can dramatically boost security of your network. Learn how CM provides you with an always-on view of potential security holes. The guide explains how using CM is a vital step toward achieving continuous security of your network – the Holy Grail for every network security manager! In the guide, you will learn how to automatically leverage vulnerability scans with CM for stronger security. Continuous Monitoring: A New Approach to Proactively Protecting Your Global Perimeter offers an easy blueprint for using automation to achieve continuous security and compliance.